This essay, which builds upon an essay about contemporary abstract painting that I wrote for The Brooklyn Rail in 2011, was just published in the January/February 2014 issue of Christie’s Magazine. Contributed by Sharon Butler / A few years ago, having operated safely within traditional painting strictures for decades, I found myself embracing a paradoxically purposeful inattention to detail, nuance and craft in my work. Noticing that many other painters were moving in this direction and, after extended discussion on my blog, Two Coats of Paint, I wrote about it in a 2011 Brooklyn Rail article, labelling this trend The New Casualism. The work I had in mind related conceptually to wabi sabi, the Japanese aesthetic of imperfection and impermanence, featuring abrupt shifts, cross-currents and a deliberate lack of formal cohesion that constructively agitates the viewer, challenging one to look harder if a painting seems poorly constructed or amateurish. For better or worse, the article struck a chord in the painting community, and Casualism has gathered momentum. What distinguishes a casualist approach is the premium on unexpected outcomes rather than handsome results. This translates into a comfort with inconsistency and a willingness – manifested in departures from conventions of colour, composition, texture, material and balance – not to impose harmony on elements that may not be naturally susceptible to it. Thus, artists including Martin Bromirski, Rebecca Morris, Jered Sprecher, Joe Bradley, and Keltie Ferris (as well as myself) have tried to make paintings that scan as objective manifestations of real-life imperfection and confusion. The complex and often disorderly experience of the everyday is the aesthetic filter through which they entertain multiple, sometimes dissonant, ideas. More playfully, Lauren Luloff, Patricia Treib, Brooke Moyse, Cordy Ryman, Michael Voss, Amy Feldman, Zak Prekop, Sarah Faux, and Tatiana Berg, to name a few, employ loose, gestural enervation and light paint handling that invites erroneous comparison to projects completed in a beginning painting class. At the other end of the spectrum, painters like Maria Walker, Molly Zuckerman-Hartung, Matt Connors, Noam Rappaport, Daniel Subkoff, and Lael Marshall take a meta approach that riffs on the process of painting itself, using the materials in decidedly unpainterly ways. But casualist tendencies suffuse the established art world and should not be dismissed so… casually. Matisse’s casualist leanings were transparent. Picasso’s were more muted, as seen in the seemingly unfinished canvases and simple line paintings in the recent “Black and White” Picasso show at the Guggenheim. Malevich, in advancing Suprematism, believed that pure feeling was to be found in non-objective painting, and that materialism could lead to ‘spiritual freedom.’ Prefiguring casualist strategies, he approached his work intuitively, unfazed by ambiguity, ill-defined parameters or truncated lines of thought. So-called ‘bad painters’ from the 1990s like Chris Martin, Judith Linhares, and Peter Acheson are also a major influence. De Keyser, Jim Lee, Richard Tuttle, Kimber Smith, and Thomas Nozkowski directly anticipated Casualism with their self-conscious resistance to ambition. Like their work, casualist pieces seem quickly made, self-amused and untethered to the rigorously structured propositions and serial strategies favoured by artists of previous eras. This is not to say that the new approach is unserious or heedless of art’s history and evolution. But it embraces and memorialises unpredictable encounters in the studio in ways that their predecessors did not, and may regard the traditional avenue of creating a brand and working it for 40 years as unadventurous. By integrating painting – a traditional form – with a more improvisational and conceptual contemporary sensibility, Casualism presents a principled alternative that stretches, even distorts, traditional boundaries but does not ignore them. Peter Acheson, installation at Novella. Comparable aesthetic dynamics have arisen before. In the 1970s, for instance, female artists like Elizabeth Murray, Mary Kelly, and Ree Morton countered the macho posturing of the minimalists by working from an intimate point of view that embraced messy everyday detail. Casualist painting, then, is a synthesising phenomenon. Its very open-endedness leaves ample room for incremental refinement. In December at the Miami art fairs, the casualist approach, albeit on a larger, more-commercial scale, was evident in the surplus of raw canvas and linen, the inclusion of unstretched paintings and the elevation of everyday materials like carpeting to art-supply status. Recalling avant-garde European movements from the 1950s, 1960s and 1970s such as Arte Povera, Art Informel, Art Brut and Surface/Support, Casualism stands as a vibrant and durable approach that may be beginning to earn its own place in art history. Thanks Dan. I originally posted the unedited version by mistake, but I have since switched it. Awhh! This painting movement is adorable! If people are irked by it it's because it's so stinkin cute!! Fun wittle shapes and colors and materials all together like a basket of kittens! value of art. what gives a long labored effort vs a simple gesture any financial worth? I dont count pennies as I paint. in this sense and in the direction of this "new" creative effort art should be devalued and and claimed as worthless. the real danger to art is reckless capitalism. Provisional…..arranged or existing for the present, possibly to be changed later….as defined by dictionary. Words are important in writing. They have meaning, and sometimes specific meaning. Art, while having tangential relationships to writing, is not solely specific in it meaning. It is inherently ambiguous. The maker makes with their back round and the viewer views with theirs. They may not be the same. Therefore, isn't all art inherently Formal, provisional, and casual, all simultaneously? 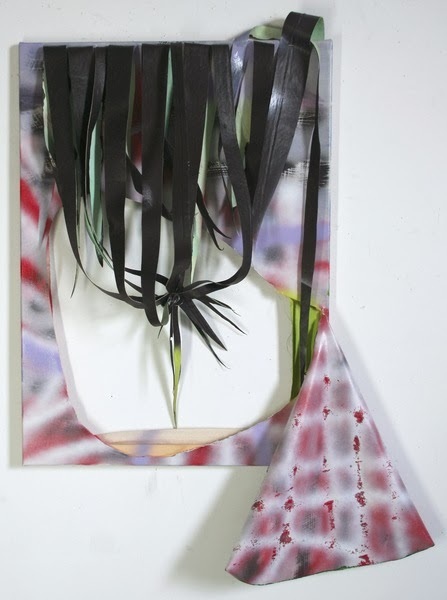 This work is interesting, but why only write about abstraction? Yes words are important, but we also need some sort of short-cut so we don't have to come up with a long explanation for the key words. here is a pretty good explanation of Casual-ism in the context with lots of pictures and links. going back a bit and look at Matisse's various large Dance paintings. nothing formal or provisional there to me. Why is this type/school of painting STILL being talked about? Let's just call a lot of this stuff what it is: not very good painting. A slice in the canvas exposing a stretcher bar, a random flare of spraypaint, etc., This whole thing has become a meta joke/punchline in the painting community. Making paintings that show little attention to craft or detail aren't anti-heroic or compelling, they're just lazy and entitled, and being made by a plethora of painters far and wide who look at Tumblr. How do artists like Noam Rappaport, Jered Sprecher, or Zak Prekop even end up in an article like this? 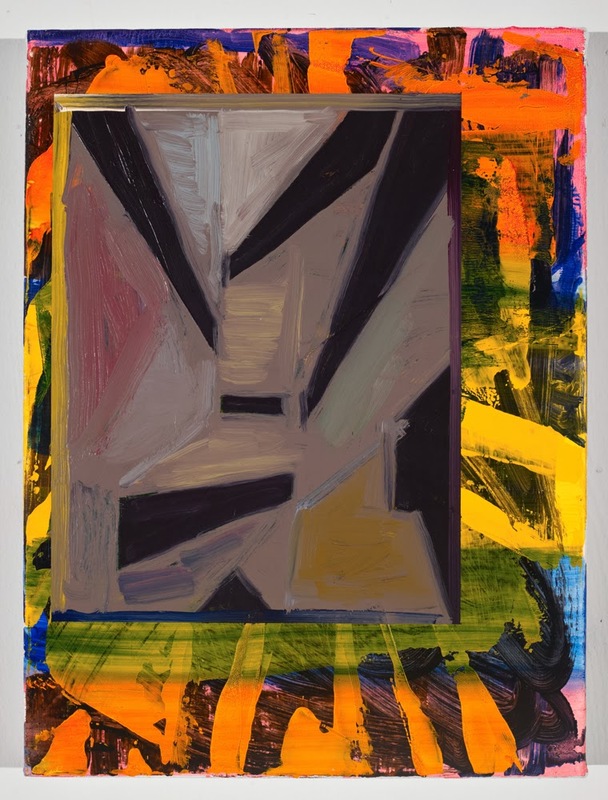 You think Zak Prekop's work is slapdash and playful, reminiscent of a beginner painting class??? You say that galleries have been slow to embrace this work. Have you ever been to the Lower East side or a NADA fair? Do people collect Rosy Keyser? How are Joe Bradley's pre-fab stretcher Robots selling? And how are you going to lump yourself in with artists like Joe Bradley, Keltie Ferris, and Rebecca Morris? Nice how the article ends with an image of your work. This is the problem with the internet: the ease of self-publishing. Hey Tip, did you even READ this? Seems like a lot of painters were invested in the status quo when this article first came out. Interesting that ANY kind of art, let alone painting, has the power to rankle artists these days. Tip Duncan: This article was originally commissioned by Christie's Magazine several months ago. The editors chose the images. In any case, I don't apologize for running images of my own work. I am an artist and most of what I write on the blog is informed by my studio practice. Expanding my view to include work by other artists who seem to be exploring similar terrain is natural; whether or not they are thinking exactly the same thing I am doesn't matter as much as finding a connection. I certainly don't think any of the artists mentioned in the article would say, "Hey, I'm a casualist." I'm not sure anyone would. The term is meant to help articulate qualities of some painting, not as a way to narrow or define our practices. I'm simply trying to point out tendencies that I see, and recognize that not all the painters mentioned engage in all the practices described in the article. Of course I go to the Lower East Side, NADA, etc., where many of these tendencies are indeed abundant. Times have changed since I starting thinking (and writing) about this several years ago. In New York artists and critics have become cynical, but, for better or worse, the phenomenon has expanded to other communities–particularly MFA programs around the country. Problem with labels such as casualists and provisional is that more than identifying tendencies or 'finding a connection' they become trends and they become restrictive. We can articulate the properties that seem to be present in some works but that does not address their inherent value or quality , Yes I make judgments in Art just as I do in every thing else in my life…choosing friends, coffee, cars I drive, the tv I buy, the computer I use…endless…We all do. Sorry to say, but it seems that this is just another name for bad BFA/ MFA art it just looks like 'slacker style'—not much thought not much intention, im to cool to care. I do respect Rubinstein's point of view though, and see value in much of what he writes but it seems that painting is always in place where someone thinks it needs to be rescued. And these new labels might serve the purpose of discussion but they don't do a lot for painting. Isn't it more interesting to debate what these approaches say about our culture than to judge whether the are good or bad? This self-serving focus on a made-up "ism" is getting tiresome. I mean, the whole "Casualist" idea is just a re-hash of Rubenstein's "Provisional" idea. And as Rubenstein pointed out,this notion of "lack of finish" is nothing new. To attribute " Casualist" tendencies to Matisse and Picasso is absolute comedy! On the other hand, I do enjoy seeing academic-type painters talk about craft and " good painting". Boring!As if such a thing could be defined! The only thing this "Casualist" nonsense has achieved is to excite no-nothing curators and art students. Painters in the meantime continue to grapple with painting problems, in spite of silly catch phrases and those who seek to cash in on them. I wonder if this type of painting or theory about making work is has developed into it's own set of rules or "formalism." At Nada or and other trend setting venues there seems to be more of this than anything else and it seems it has huge commercial value at the moment. Regardless, I love the ideas that sit behind the work but to find them (the non-answer) as the answer seems to be too simple, too easy and not specific enough to individual ideas, mark making, tendencies etc. It no longer seems fresh, full of chance or innocent but now rather self conscious and purposeful. This is a great discussion! But it looks a little clumsy to link it to "Wabi-Sabi" when many of the works referred previously seem to have little deep philosophical intention (as you suggest, it's unintentional, maybe even just for fun), but instead rely on physicality of materials, a 'medium is the message'. The artists voices are often mute about concepts (or they are tenuously implied after the fact, just like it seems to be happening here), but gain some traction in a liking or preference for similar style works – there is strength in their numbers. What you've done is group some of them together to make a point, but now it is becoming a trend influencing many other painters – so maybe it is an 'ISM' in the making, but it's not a very good one – it can't possibly last, the works will 'casually' fall apart or fade, or disintegrate, but I guess that's another non-intentional 'intention', right? That this style of painting (if it is actually painting, or casual art studio materials assemblage) obviously rankles with others is not yet a badge of credibility. No doubt 'casual/provisional' does reflect aspects of contemporary culture, all the hopelessness and despair, and maybe this could give it a raw political edge akin to Arte Povera, were it not for the cute as candy colors, pop-art esthetics and urbex-style presentation, trying so hard to be so ironic – don't look at me, look at me! – which implies a self-regard or relevance that takes time to earn in art critical contexts. Hey, that's art history, wait a while, after the dust settles it will become clear if it is relevant, or not. Good luck! Anonymous reported something about formalism technically meaning attention to established forms and rules. That's funny because when that word is used by critics and artists, it often implies a put down of abstract expressionism. Those guys(the abstract expressionists)and their contemporary ilk are ANYTHING but close to the dictionary meaning of formalism as it is here reported. Even when Roberta Smith uses the word as a put down in order to promote other art with content (political) to her liking, she is implying a meaning far from that stated here. Sharon I'm glad you pointed out that artists are not self-identifying as part of a stylistic movement. I've had some qualms with that. And I was glad to see Matisse mentioned in the comments section because I think that a painting can be incredibly sophisticated and sparse at the same time. Its taken some time to catch up with what Support/Surfaces responded to in Matisse and I'm glad that their work is currently getting attention in the States. Painters can tend to obsess about displaying how much rigor went into making and I'm excited to see so many colleagues confident enough in their practices to let that go. I worry that the conversation becomes confined to what things look like vs the content that drives the work, which is what makes the work compelling. And sure, in many cases there is not much driving the work, and so you have "mannered" looking paintings. I think its important that artists are getting involved in the discussion and should be supported for such efforts. So even though I don't love the labels, it takes courage to share a point of view with what can be a very snarky audience. I think contrast has to be there to provide the necessary tension. So "casual" (which I would translate not as "careless" but as unafraid or as excited by imperfection) may be stronger juxtaposed to some obsessiveness—to give some torque and heft and beauty. I know I’m late to the conversation, but I’d like to add my observations as someone who has studied a fair amount of art history and occasionally paints. I’d like to contribute what has led me (a 36 year old cis white gay male) to focus on casual abstraction in my work. First, learning about dada. Then, Abstract Expressionism. Next, deeply researching the work of Warhol and Basquiat, then, Rauschenberg and Twombly. Reading about current art movements and the obsession with things that are new, provocative, strange, pushes boundaries, and so on. Add the suburban culture I experienced, then the urban poverty I experienced, feeling as comfortable at a basement punk show as an art museum, but always feeling like an outsider. After learning about dada, I felt compelled to paint on the back of a canvas, showing the stretcher bars. What else could I add to the canvas? Maybe I will use wool fabric instead. Should I use crude oil as a medium in reaction to the BP oil spill? Bird feathers and fish bones? The films of Todd Solondz, Gregg Araki, and others. Becoming obsessed with non-conformity and contrariness. I learned that other artists, not mentioned in Gardner’s or post-2006 Artforum, had used other methods for destroying and rebuilding, spreading paint, with brooms and mops, searching for a new vocabulary or some novel method of creating art that will delight themselves, an audience, or the media. Feeling like I would need to be locked in a cell with every art book and a computer with every browser tab open so I can learn about all these artists and who they knew or worked with, and who they influenced or reacted to. And so I carry on, on a similar journey, getting feedback along the way. I just read this article again, several years after the idea of casualism was first floated and it seems like a lot of artists who used to make this kind of work moved on. Have artists become more conservative? Did they feel like they took the deskilling thing as far as it could go? Did the MFA students go back to more traditional painting or become sculptors? It seems like artists whose work is rooted in identity have managed to make traditional painting and drawing kind of hip.